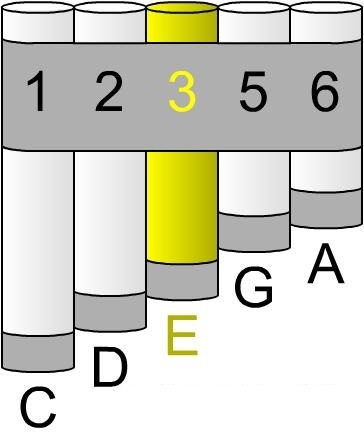 If you're interested in building a pan flute, or a set of pan pipes, this is the page for you! 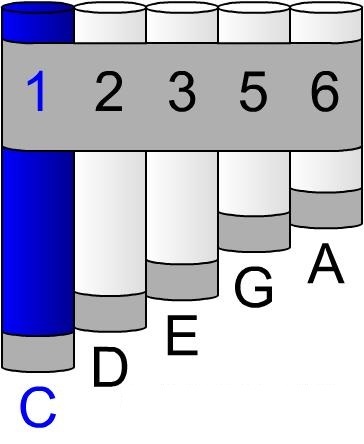 It includes: 1) Virtual Panpipes you can play right now on your computer; 2) directions on how to build a 5-note set of panpipes; and 3) information on building and playing an 8-note set of panpipes. 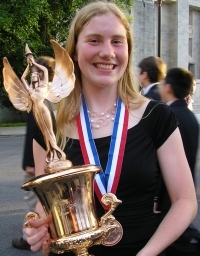 Also, if you're participating in Science Olympiad, be sure to check out our 2014 Science Olympiad Addendum. 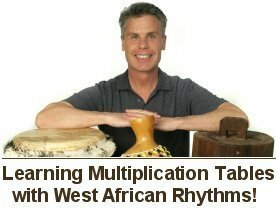 So take a couple of minutes, play the virtual panpipes, learn how to make your instrument, and discover all of the great songs your homemade panpipes can play. 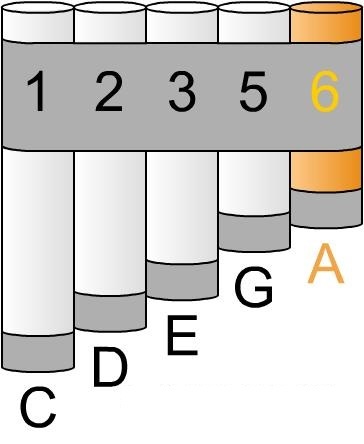 Our Virtual Panpipes play the 1st, 2nd, 3rd, 5th & 6th notes of the Major Scale. 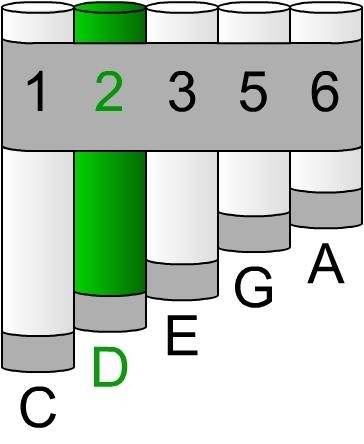 It's called the Pentatonic Scale (see below). As you will hear, the longer the pipe, the lower the pitch — the shorter the pipe, the higher the pitch. Start by clicking your mouse on each pipe (below). Then, choose a song and start playing. Playing tip: If you hold down your mouse, the notes will last longer. If you would like to make this instrument, just follow the directions below. Begin by getting approximately 2 feet of 1/2-inch/schedule-40 PVC sprinkler pipe. 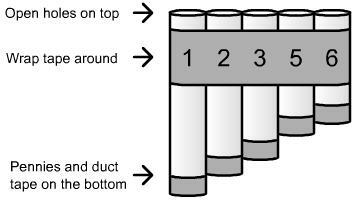 2) Place a penny over one end of each pipe and cover each penny with a 2" X 2" square piece of duct tape. 3) Wrap about 18 inches of duct tape around the set as shown on the right. Blow across the top of each pipe — it's just like blowing on a soda bottle. 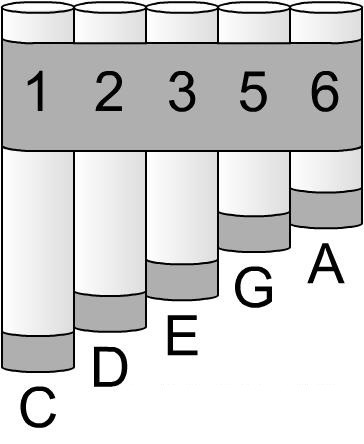 Phil and his daughter, Sarah, have created a special resource on building and playing panpipes. It includes step-by-step instructions, sheet music written in treble clef, and play-along music tracks. It has everything you need to be successful with your project, from beginning exercises to duets and quartets you can play with your friends. 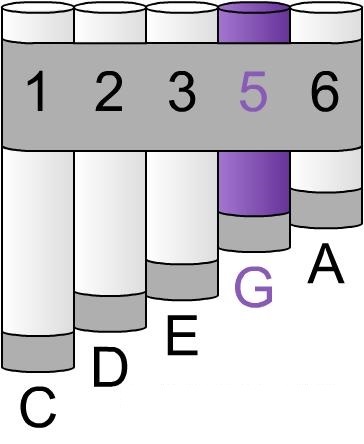 Just like our water bottle xylophone, glockenspiel, fraction tubes, melodic tube drums, and didgeritubes, our panpipes are tuned to play an 8-note scale in the key of C — and if you want more than 8 tubes in your set, check out our new Science Olympiad Addendum!